Connect speakers or headphones to your USB-equipped PC even if it has no sound card! 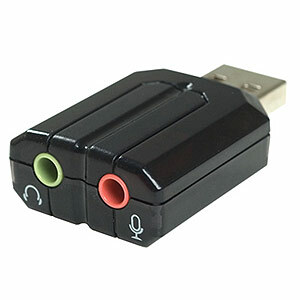 This simple USB audio adapter plugs right in to a USB port, and lets you enjoy stereo sound again. A second port accepts input through a microphone. No drivers to install. Requires Microsoft Windows 98SE+, Linux or Mac OS. 10.1+.